Tutorials in Dublin is delighted to provide FREE German resources used with students in the German tutorials. In the FREE Junior Cert German resources, you will learn about the use of some tenses in German letters, a key part of the written production section in the exam, for example, the perfect and imperfect tenses: Du hast geschrieben, dass …. ; Es war… You will also be able to check your knowledge of some basic vocabulary essential for all sections of the exam, for example, body parts: leg, hand, nose… and numbers: two, twelve, twenty… and learn how and when to use the genitive case: the woman’s handbag, the man’s house, etc. In the FREE Leaving Cert German resources, you will learn about clauses and the use of some conjunctions which affect word order, for example, because, when, etc. (an understanding of which is essential for the reading comprehensions and written production section of the exam) and how to form and use the conditional: I would go to the theatre; You would help me, etc. You will also be able to practice for the German oral exam by reading and filling in the blanks of two oral topic templates: talking about yourself (Details zur Person) and hobbies (Freizeitbeschäftigung). You will also be introduced to some very useful expressions, phrases and proverbs which can be used in the written production section of the exam as well as the oral. German oral exam Details zur Person: Ich heiße_____________. Das schreibt man__________. Useful expressions, phrases, proverbs Ende gut, alles gut. = All’s well that ends well. So ein Pech! = Just my/our luck! In the FREE workplace German resources, you will be able to read and practise typical German dialogues: Erste Kontakte (meeting someone for the first time), im Telefon (asking someone for their contact details over the phone) and im Restaurant (ordering food in a restaurant). You will also be able to learn more about the accusative case by reading some sample sentences and their translations. You will also learn that learning many prepositions in German is not that straightforward, for example, the preposition auf can mean to, in, on, at and preposition in can mean to, on, at as well as in. Erste Kontakte A: Guten Tag! Ich heiße Frau Müller…. Wie heißen Sie? / Wer sind Sie? Im Telefon A: Wie heißen Sie, bitte? A: Wie ist Ihr Familienname? A: Noch einmal, bitte langsam! Im Restaurant Kunde 1: Herr Ober! Wir möchten gern bestellen. Der Kellner: Bitte, was bekommen Sie? Kunde 1: Ich nehme eine Tomatensuppe und Bratwurst mit Kartoffelsalat. Der Kellner: Und was möchten Sie trinken? Wir haben einen Garten. = We have a garden. Es gibt einen Dom in der Nähe. = There is a cathedral nearby. Sie kauft eine Handtasche. = She buys a handbag. Sie braucht ein Handy. = She needs a mobile phone. Es gibt ein Geschäft in der Nähe. = There’s a shop nearby. Sie trägt das Tablett auf den Balkon. = She carries the tray to the balcony. 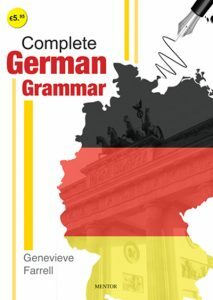 For full access to the above resources and more, you can order the book Complete German Grammar.